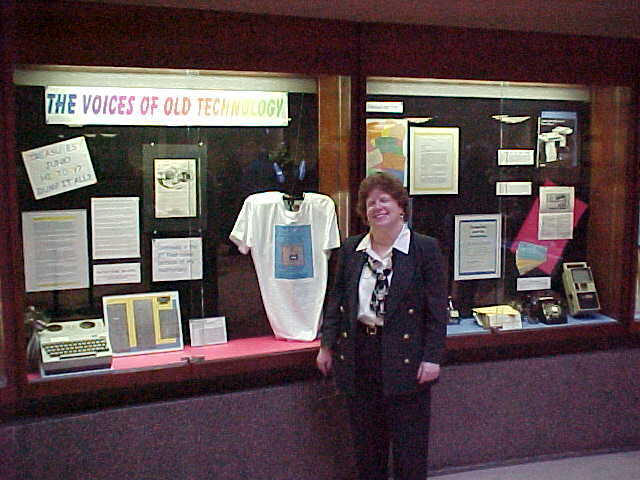 The mission of Voices of Old Technology - A Museum in the Making is to enhance the educational experience at Queens College through an interdisciplinary approach to the exploration of technology development. To accomplish this, Voices of Old Technology collects, preserves, documents, displays and interprets selected technologies and related materials. The collection emphasizes, but is not limited to, office and educational technology. Related items collected from Queens College and other CUNY sources highlight the history of the College and the University. The College and CUNY items and information are highlighted against a backdrop of what was going on in the broader community. Voices of Old Technology - A Museum in the Making is not an official museum at the College. Our exhibit catalogs and materials are designed for the web. We present below for your viewing pleasure information about each of our exhibits. The numbered exhibits below are the major Voices of Old Technology exhibits. Voices... was named in Summer 2000, and has been increasingly active since then. We posted on first website as part of the College's website in July 2000, and mounted our first exhibit in January 2001,in both the Rosenthal Library Barham Rotunda and in the 2nd floor display cases (outside of Rosenthal 230). We now have some exhibit always running in the 2nd floor display cases, and often we have overlapping exhibits in different locations. Although some small exhibits such as Homecoming exhibits have the same title, they always have new material. --- at the Flushing Library (five exhibits so far!). They are listed below as well. This photo exhibit was installed in two parts, due to the planned use of the 2 wall cases during December for an Art Department exhibit. This part of the exhibit highlights signage as well as other SIGNS on campus and in the immediate neighborhood. --- for identification / direction - where am I and how do I get from here to ...? --- symbolic and other types of "signs"
- Sign Here - in the standalone case to the right of the wall cases - This will be the first part of the exhibit to be installed. On December 27, 2007 we marked the 350th Anniversary of the Flushing Remonstrance, a document written and signed HERE in 1657 that is generally recognized as an important landmark in our commitment to freedom of religion. The text of the Remonstrance will be featured, surrounded by photos of a variety of religious institutions in the Flushing area. Citizens of Flushing risked everything and took a stand - they signed a document that changed their world, and still influences ours. Have we accomplished what the signers of the Remonstrance envisioned? Have we gone beyond? Have we missed the mark? Queens College, which opened in October of 1937, is celebrating its 70th anniversary this year. This case is our "teaser" for the College's 70th Anniversary exhibit, created by Steve Barto, College Archivist. On December 27, 2007 we mark the 350th Anniversary of the Flushing Remonstrance, a document written and signed HERE in 1657 that is generally recognized as an important landmark in our commitment to freedom of religion. In our current exhibit, we show a variety of views of old Flushing. Some of the buildings in them still exist. How many do you recognize? The commonalities of hopes, dreams, and daily life from era to era and from group to group are significant. The hard work of owners of Mom and Pop stores, the importance of improving educational opportunities, the beauty of the town, the creativity and strength of the people, and the striving for something better are themes that transcend time, technology, race, religion, national origin. We don’t wish to overly romanticize either the past or the present --- the stunning realities and seeming contradictions include that the Flushing of the past had inits history a strong Underground Railroad as part of the route for slaves to escape northward, as well as its own slavery of Blacks and Native Americans. Our "Women and Flight" exhibit uses aviation and related fields to highlight that women can and do excel everywhere, and that this is not a new phenomenon. Women have had major roles in Long Island's development as "The Cradle of Aviation." We have tried to give a variety of images of women in this still evolving field as well as to show a wide range of ways many people contribute to the development of every field. This exhibit opens during Women's History Month. We hope it gives you food for thought about women as well as about everyone's contribution to helping us move ahead together. This exhibit is ***an expansion*** of one we placed in the Flushing Library in Fall 2006 - sponsored by the Queens College Library and the Queens College American Studies Program as part of a program of collaboration with the Queens Library System. As you look through the barrel of a kaleidoscope, you can turn the wheel at the bottom and see spectacular colorful patterns that change --- each time becoming a yet even more beautiful image. We are fortunate to have the same kind of "kaleidoscope" of people, cultures and traditions right here in Queens. Looking at the holidays celebrated here by people of many different religions, cultures and traditions gives a colorful and ever-changing view of where we live and work. One of the wonderful things is how celebrations of different groups are both so similar and so different, and how different groups have shared new holidays and have added their own traditions to old holidays. We hope our exhibit will give you some food for thought and a new perspective on our similarities and our differences. This 3-in-1 multifunction device is a Sears Silvertone Wire Recorder Combination (radio, phonograph, wire recorder). This type of device was used in some college language labs as well as in a variety of other education, office and home settings. It was "cutting edge" technology. Queens Kaleidoscope: Holidays, Celebrations and Traditions!! We hope our coming December exhibit will give you some food for thought and a new perspective on our similarities and our differences. When In Doubt, DON'T Throw It Out! Food Court - Dining Hall as "The History Room" Another exciting and fun exhibit in an area shared with the Oral History Project and the QC Archives. Added attraction: DJs (in the real sense of the word! ): Virginia Wood and Jack Verga. Milestone Technology Birthdays: CUNY's BITNET - and More! We hear things like "50 years of... , " "125 years since..." and "25 years ago today..." What technology milestones are worthy of being recognized in this way? The date something new was heralded at a major event? The day some critical piece fell into place? The year that economics or size made it practical? Or maybe the inventor's year of birth or death? Do we celebrate the anniversary of its appearance in a consumer magazine as an eagerly anticipated hot new item? Does it really matter what date we choose, as long as it helps encourage our own creativity, our appreciation of the creative process, and an interest in the details of our history? In this exhibit, we highlight a few of what we consider milestone technology birthdays for 2006 - primarily in the areas of educational and office technology. Some of the important events highlighted are of course related to CUNY, Queens College, and local history. Otis Elevator, ENIAC, UNIVAC, BITNET, the Kurzweil Reading Machine for the Blind, and the Four-Color Theorum are just a few of the milestones drawing attention in this exhibit. One of the exhibit items emphasizes a familiar theme of Voices... - "When in Doubt, DON'T THROW IT OUT!" Christie's Auction House listed the actual sales price of the big-ticket items at their 2005 "Origins of Cyberspace" sale. An 8-page, typed, somewhat yellowed proposal from 1946 on the future of networking computers --- by the two hardware experts who developed ENIAC --- sold for $ 72,000! The caption suggests that the viewers of this exhibit might want to think twice before discounting or discarding a variety of items that may have some historical interest --- it asks "What have you tossed out?" The section on Lewis Latimer focuses on how each invention has many descendants and cousins, and that the inventor has no way of knowing for sure how others will move ahead creatively from that invention and what other things will become possible because of it. Summer - A Good Time to Explore, Discover and Enjoy Queens!! Here's a preview of some things to do and places to see in Queens. We have parks, beaches, gardens, historical places, colleges, and cultural institutions. There's always something interesting going on, new places to explore, and an incredible variety of ethnic celebrations and foods. Free outdoor programs are easy to find in the Summer. Many of these places can be enjoyed year round. While our focus is the Flushing area, we hope this reminds you of the wide diversity of opportunities to have fun in our beautiful Borough of Queens, and encourages you to find more. Take a mini-vacation in your own back yard! This is our fourth exhibit in the Flushing Library. Exhibit co-sponsored by Queens College Library and the Queens College's American Studies Program, as part of a continuing collaboration with the Flushing Library. Three separate exhibits - or are they? More about Francisco Patino: The College's press release about the May 18, 2006 QC event during the ABC-TV American Inventor finals is at http://www.qc.cuny.edu/nis/Releases/viewNews.php?id=205. Event, exhibits and lunch for the Class of 1956, after Commencement --- in coordination with the QC Oral History Project and the QC Office of Alumni Affairs and Events. It's Spring in Queens! Enjoy it With Us! What a beautiful Spring! Our third exhibit at the Flushing Library, co-sponsored by Queens College Library and the Queens College's American Studies Program., as part of a continuing collaboration with the Flushing Library. Photos by Jeff Castellan, Syd Lefkoe, and Ellen Rondot --- at Queens College, the Queens Botanical Garden, and a Greenstreets space on Union Turnpike. We were pleased to bring a second exhibit to the Flushing Library. Exhibit co-sponsored by Queens College Library, Queens College's American Studies Program, and the Queens College Office of Events, as part of a continuing collaboration with the Flushing Library..
Did You Know I was Your Neighbor? We were pleased to bring an enhanced / expanded exhibit on Walt Whitman in Queens to the Flushing Library in December 2005. It was a follow up to the Walt Whitman Garden dedication at the College in July 2005 (see entry for this exhibit a few items below). Exhibit co-sponsored by Queens College Library, Queens College's American Studies Program, and the Queens College Office of Events, as part of a continuing collaboration with the Flushing Library..
Food Court - Dining Hall as "The History Room"
Another exciting and fun exhibit in an area shared with the Oral History Project and the QC Archives. Added attraction: DJs (in the real sense of the word! ): Virginia Wood and Jack Verga. For many of us, our favorite music is the music we grew up with - the music itself, the artists, the special quality of the instruments and devices that played it, and the related defining / important moments of our lives. The distinctive sound of … (whatever it was) just can't be beat! In this exhibit, we share images of different generations enjoying their music. Many of these images are from our yearbook - the QC Silhouette - through the College's history. We highlight some of the instruments and devices, as well as some of the people who made the difference --- many of them with ties to Queens College and the Borough of Queens. As part of the Walt Whitman Garden dedication at the entrance to the parking lot near the Student Union, we were pleased to assist in the preparation and mounting of the exhibit in the SU Corner Bistro that accompanied the program. Event, exhibits and lunch for the Class of 1955, after Commencement --- in coordination with the QC Oral History Project and the QC Office of Alumni Affairs and Events. BYOL Club - Dining Hall as "The History Room"
An exciting and fun exhibit in an area shared with the Oral History Project and the QC Archives. Added attraction: DJs (in the real sense of the word! ): Virginia Wood and Jack Verga. Pick a field – any field - and you’ll find many landmark dates and exciting times in technology development and education, with Queens College and Queens people heavily involved. Perspectives on common themes in the development and growth of new technologies. We hope this exhibit helps you rediscover some of that childhood joy and wonder as you see and hear the ever-changing patterns of flight over campus. It is especially fitting that this exhibit is at QC and is in the Benjamin Rosenthal Library, which was named in memory of Queens Congressman Benjamin Rosenthal. Among Congressman Rosenthal’s focal interests were airport safety and the reduction of aviation-related noise levels in the community. Event, exhibits and lunch for the Class of 1954, after Commencement --- in coordination with the QC Oral History Project and the QC Office of Alumni Affairs and Events. 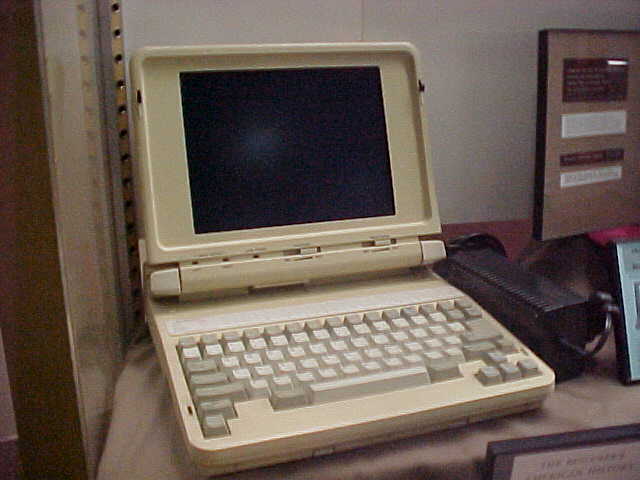 The Zenith Laptop at the top of this web page above is circa late 1980s, and was used at the College. It is part of this exhibit. Forget for the moment whatever "museum" means to you - especially if it means musty, dark and dull. Wherever you go, if you pay attention, look around, and keep your eyes open, you will be delighted by a sometimes surprising array of wondrous artistic and historic items - not always in a formal museum - to appreciate and understand! This exhibit looks at selected museums, galleries, collections and displays on and off campus. Some very pleasant museum surprises may be related to an exhibit topic that goes beyond what we expect at a specific museum. Featuring selected circa 1940s technology used at the college, as well as photographs by Ellen Rondot, Jeff Castellan, and Syd Lefkoe. Patio Room Area - Food Court as "The History Room"
*** On October 20th, the upstairs portion of the exhibit closed, and the remaining exhibit continued outside the RO 230 Auditorium. We wouldn't put this discarded old metal Queens College fan (displayed in the exhibit) in our office waiting rooms today. The wide openings and metal blades could easily hurt inquiring little fingers. New designs protect those fingers. But should we try to "protect" inquiring minds? And how do we help students discover their creative potential? There has long been a tension between a perceived need to protect our freedom by curtailing it, and the importance of encouraging learning, questioning and creativity. We hope to highlight this tension in our exhibit, and to encourage discussion. Society moves ahead when each of us is creative in what we do. When we are not merely passive technology users, technology can help to feed this process. We see some of the themes common to technology change as we begin to look at photography and cameras. The photographer wants the equipment to permit flexibility as well as control over various aspects of the image as it will appear, and selects equipment that will be right for a specific type of photography. As technology develops, it has permitted this in ways that may seem comical to us today. Note the instructions in this exhibit case for new 1920s era flash photography, describing how to use a match with a flash sheet to set off the flash. Event, exhibits and lunch after for the Class of 1955, Commencement --- in coordination with the QC Oral History Project and the QC Office of Alumni Affairs and Events. · his fans continue to add new formats of his work to their collections, in order to enjoy them on new devices designed to enhance his work. 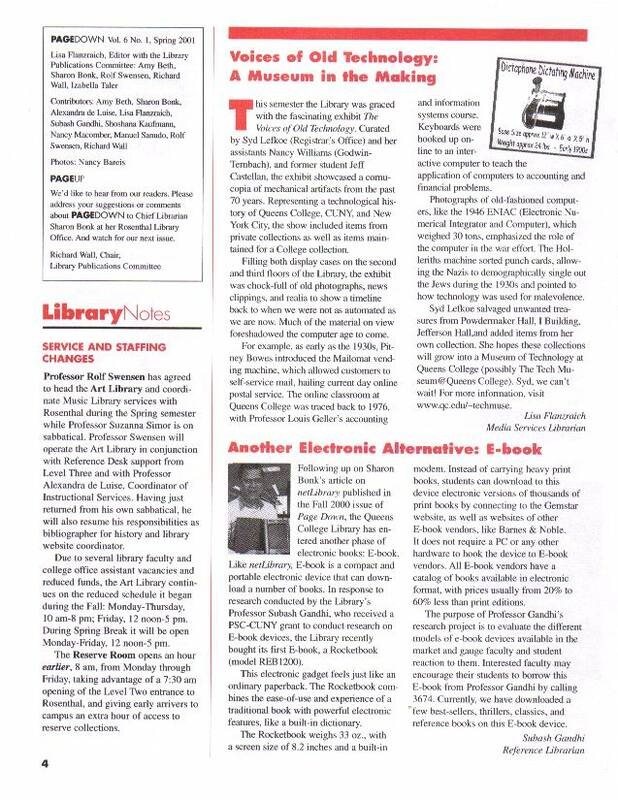 PageDown Rosenthal Library Newsletter - Spring 2003, page 3. An exciting and fun exhibit "Perspectives on Our History --- Through Technology," highlighting some pre-computer educational and office technology, as well as "Short Takes" on a variety of other topics. Added attraction: DJs (in the real sense of the word! ): Virginia Wood and Jack Verga. Our "Museum in the Making" is not an official museum of the College.